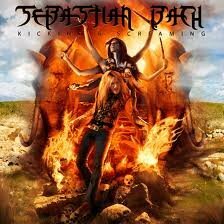 SEBASTIAN BACH - KICKING AND SCREAMING LTD. EDIT. (CD+DVD DIGI) | Online Shop | Wizard LTD. Album: "KICKING AND SCREAMING LTD. EDIT. (CD+DVD DIGI)"
As the lead singer of Skid Row, Sebastian Bach was one of the last true rock stars. His looks, showmanship, charisma and pipes perfectly suited the melange of heaviness and hooks that his band offered. Notwithstanding the change of musical climate which followed, he managed to keep himself very busy and musically relevant, even after his departure from the band. Far from just being a multi-platinum recording artist, singer/songwriter/actor/entertainer Bach has expanded his career over the past decade to include episodic television with a 5-season recurring role on the CW’s hit series “Gilmore Girls”, starring roles on Broadway (“Jekyll & Hyde”, “The Rocky Horror Picture Show”) and national touring companies (“Jesus Chris Superstar”), as well as an ongoing relationship with MTV/VH1. Bach’s first all original solo album “Angel Down”, released in 2007, presented the artist returning to his roots with a mixture of hooks and catchiness, with the aggressiveness of modern day metal. Guest vocals from the likes of Axl Rose put the icing on the cake on an album that restored the faith of all the “mothertruckers” around the globe. In early 2011, Bach signed a new worldwide recording contract with the rising star Italian-based label Frontiers Records and headed to the studio under the direction of Bob Marlette (Black Sabbath, Shinedown, Atreyu, Filter). Aptly entitled “Kicking & Screaming,” the new album presents the talents of young virtuosic guitarist Nick Sterling and drum pro Bobby Jarzombek (Halford, Riot, Iced Earth), alongside Bach’s inimitable, incomparable vocals. The result is a high-energy, hard rock album. “I could not be happier with “Kicking & Screaming”, tells Bach, “the music follows along the lines of 'Skid Row', 'Slave To The Grind', 'Subhuman Race' and 'Angel Down' , but the songs, performances and sound quality are beyond what I could have ever imagined”. The songs are "heavy, interesting, classic sounding, modern sounding, completely rock 'n' roll — just how we like it!". The "Kicking & Screaming" album cover was created by artist Richard Villa, reflecting the lyrics as well as the brutality of the music. “It's gonna be a rock 'n' roll to the 9th degree album — very cool, trippy and nightmare-ish," concludes Bach. Then if you like rockin' guitar riffs, high-energy songs and performances, deadly drums of doom, and ear-shattering screams, we got your rock right here! John 5: Guitars on "TunnelVision"